Fresh Eats: 9 Restaurants You Don’t Want to Miss in April! Chope’s taking you on a culinary adventure this April with amazing restaurants from Hokkaido to LA – perk up your palate with nine new dining spots for you to check out this month! A well-baked loaf of bread is just as crucial to a good sandwich as an al-dente plate of pasta is to a good carbonara – it’s an art form to be cultivated, and Firebake aims to do just that in sunny Singapore. Tear into freshly baked artisanal loaves baked to perfection in their wood fire oven and tuck into other European classics while you’re at it – like their Cured Norwegian Salmon ($25++)! It’s cured in-house, is incredibly moist and tender, and exhibits none of the dry flakiness that’s frequently associated with a salmon dish. Have a sweet tooth? Their Bread & Butter pudding is bound to satisfy and is made with that same amazing bread! Want to feel like you’re sharing dinner with a group of friends on vacation even if you’re just getting together after a long day at work? Don Ho’s definitely the place to be – it’s perfect for group settings and beautifully furnished to boot: a step into the hidden restaurant on Keong Saik Road (the entrance faces the alley) instantly transports you to a lush tropical paradise. 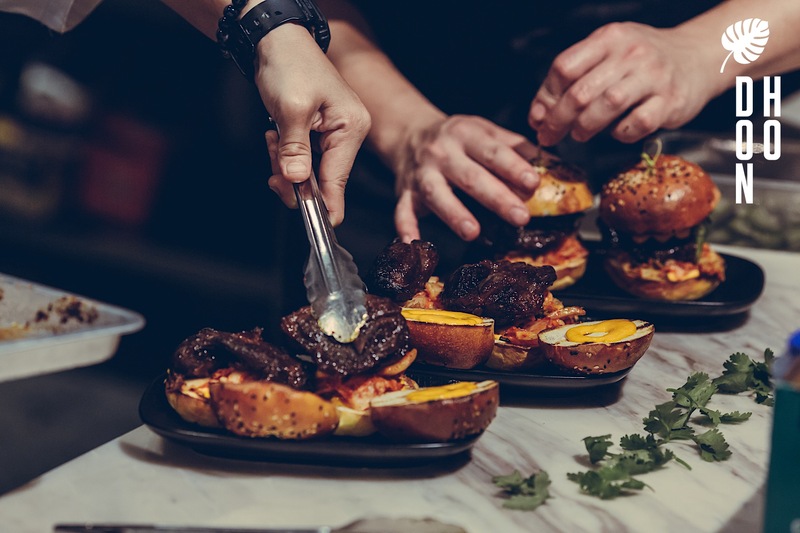 Chow down on bar food with an Asian twist by giving their kimchi-topped Pork Cheeks Char Siu Sliders ($20+) a go, or order an entire Crispy Whole Suckling Pig ($230) on a spit to get the party started! Violet Oon is at it again with flavorful nonya dishes; immerse yourself in peranakan delights ranging from amazing Dry Laksa (at $22it’s really everything you’ve ever wanted) to Sambal Bajak Udang (grilled tiger prawns with a chili padi sambal, $35) and celebrate the diversity that Singapore has to offer. Even if you’re not a satay fan (are you sure you’re Singaporean?) Violet Oon is bound to convert you with her latest masterpiece. This bar looks like it’s straight out of one of Gotham City’s exclusive nightclubs; art deco fixtures and all – except you can actually pop by for breakfast! Enjoy a pastry, fruit salad, and a greek yogurt pot with tea or coffee for $18, or get a tulip of champagne ($22) for a morning libation. Breakfast not your thing? Choose from a wide assortment of gin labels from around the globe (or more champagne, if you’d like) and pair it with decadent desserts, an assortment of hors d’oeuvres, or a hearty meal like their Gindara Black Cod with red grapes, glazed chervil roots & cauliflower ($34) instead! Fun fact: there are over 20 types of ramen and they can be drastically different from one another because they all hail from various regions all over Japan. Take your taste buds on a holiday to the Chūbu region today with the newly opened Menya Sakura! This well-loved ramen chain hails from Nagoya City, specializing in (you guessed it) Nagoya-style ramen. Give their Chuka Soba (a flavourful broth of chicken soup and fish dashi, $10.90) a slurp, and don’t miss out on their signature Tonkotsu Ramen ($10.90) that features a thick pork bone soup simmered for 12 hours. Oishi! First Japan, now halfway across the globe to America’s concrete jungle (where dreams are made of). Enjoy fresh New York-style bagels with a schmear of cream cheese or crammed full of goodies like bacon, cheese and a fried egg (if you’re craving something more substantial) while chilling out at Quayside Isle! Good food with a great view, what more could you possibly ask for? Dookki means ‘two meals’ in Korean, and this popular establishment promises to provide just that! Here’s a quick breakdown: the first meal consists of everyone’s favourite Tteokbokki, or stir fried rice cakes (they offer EIGHT types, all air flown from Korea), cooked to your preferred level of spiciness. Add rice, kimchi, and a couple of your favourite mix-ins (like sweet corn, yum) into your Tteokbokki pot and you get a second meal – Kimchi fried rice! You can also splurge on a Double Cheese Ring ($9.80++) for the ultimate cheesy indulgence. The best part? This will only set you back $18.80, and comes with free flow soft drinks! This Japanese restaurant takes you to another part of Japan – all the way from the north this time! Tengawa Hokkaido White Curry comes from (you guessed it) Hokkaido, and is the first of its kind in Singapore. The curry is reminiscent of the Cremesuppe (cream soups) you’d get in Europe, but one taste reveals its true provenance: it exhibits a kick that is omnipresent in Japanese curry. Try the curry with their juicy Iberico Pork patty ($15.80) for a deliciously creamy, yet crunchy, explosion of textures and flavours all in one bite! 25 Degrees serves up juicy, mouthwatering burgers approved by Hollywood A-listers (not kidding – they’ve been mentioned by multiple celebrities as their go-to burger joint). Sink your teeth into one of these bad boys and you’ll see why! Their Number One burger ($14) is made out of 200g USA Angus beef, caramelized onions, aromatic and creamy prelibato gorgonzola and crescenza (stracchino) cheese, smoky bacon, arugula, and thousand island sauce. If that isn’t enough to lure you there, go during 3-7pm and take advantage of their 1 for 1 deals on selected items. Sounds like our idea of heaven! #TreatYoSelf to the Best Lobster Rolls in Town!